All things considered, the original sous vide cooker from Anova is probably the our favorite kitchen gadget from the past few years. It’s so incredibly easy to use, to the point where it’s practically impossible to mess up a meal. And since the food you’re cooking is in an air-tight bag, all that delicious flavor is locked in and has nowhere to go. The original was indeed terrific, but now there’s a new version that’s just as good, more compact, and less expensive than the original. 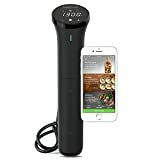 If you’ve been toying with the idea of getting a sous vide, check out the Anova Culinary Nano Sous Vide Precision Cooker right now on Amazon. You’ll be glad you did. GET CREATIVE WITH 1,000+ RECIPES – Get great ideas from the Anova sous vide guides and recipes created for home cooks of every skill level by award-winning chefs, with simple directions to walk through each recipe with ease. All available free of charge. Great for beginner and veteran chefs!